The most aggressive discursive base of trumpista fascism is anti-Mexican. White nationalists see our people as a threat not necessarily because of our political power, but because they know they must contain our demographic power. This is what is behind the Trump promise of 3 million deportations in his first year in office, versus what Obama did in 8 years. Trump has posed the challenge to himself to surpass Obama–era deportations, and during the first months of his presidency it is the only promise that is moving forward as intended. Logistically, this terrible goal was made possible thanks to Obama’s deportation machine. Furthermore, Trump’s wall, and his threat to seize our remittances are still very much on the table and are ready to be set in motion. Trump demands changes in NAFTA, not to reform the wealth it has stolen from México, but to leverage even more exploitation and theft. Thus, anti-Mexican repression is one of the most important benchmarks to measure the success of a Trump presidency. His white nationalist base will track his success by how viciously this administration represses La Raza, that is, there a direct line – an equivalency – between success of trumpista fascism and attacking our people. Therefore, our communities will be identified as the front line trumpista fascism… the first objective militaristic enactment of it within the borders of the United States. The front line of anti-fascist struggle is therefore the self-defense of La Raza. 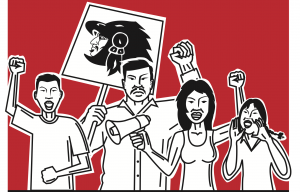 Progressives, and others who find echo in the anti-trumpista resistance, should and must stand in solidarity with our fight – not just to declare “sanctuary” campaigns, but active anti-fascist unity, that rallies around the self-defense and self-determination of La Raza, including native people and indigenous struggles. We strongly urge people who consider themselves “liberal” or “progressive” to abandon the revisionist and opportunist position arguing that Trump’s base of support is really more about “the needs of an alienated white working class,” and instead accept the manifest reality that Trump represents the global crisis of U.S. imperialism and capitalism, Trump supporters represent a violent white supremacist movement, and that the U.S. state power has now taken on its most violent and dangerous form as trumpista fascism. We must all contribute time and resources towards building a broad left-wing, anti-fascist unity. Democratic Party collaborators, as with all collaborators, must be exposed, precisely because this is a fight against fascism, and there is no middle ground in this struggle. You are either a fascist (including collaborators) or you are an anti-fascist; a friend or an enemy; a trumpista or an anti-trumpista. This “binary” might make some liberal-minded people uncomfortable, but this “binary” is not of our making… This “right versus left” political clarity is what fuels trumpista fascism, so much so that trumpistas are willing to sacrifice their own constitutional order at the altar of “Making America Great Again”. So far the so-called “#resistance” has expressed no comparable political clarity what-so-ever. We must develop closer ties to our friends within the current borders of the U.S., in México, and throughout Nuestra América. We must remind ourselves that there are 50 million of us within the political borders of the empire, and if trumpistas think we are going to let ourselves be rounded up and attacked, we must let them know, to their faces, that they have another thing coming. Furthermore, we must remind ourselves that there are 115 million of us just on the other side of the border wall, in México proper, and another 550 million of us in Central and South America. Today, more than ever before, internal UdB unity is essential because history has assigned to us an important role in this struggle. We must introduce and clarify what we mean by the general concept of self-defense – “Auto-Defensas Anti-Trumpistas,” and explain how this is a new stage of struggle. We must educate our communities about the historical precedent of self-defense. Each of the internal structures of Unión del Barrio must develop creative ways to explain and enact what “self-defense” must look like in our communities, in practical mass-based terms, and through our actions. Everything depends on a program that is accessible to our communities, and that the interpretation/ legibility of the concept of community self-defense be understood on a mass-based level. We should include electoral politics and vigilance, to keep track of, and expose elected fascist trumpistas and those that collaborate with them. We should not discourage voting, but challenge those who suggest that this is the only legitimate space of struggle. (i.e. Tu voz es tu voto). We need a sector of struggle that will focus its work on economic development towards building economic self-determination. This form of struggle should be material, and quantifiable, based on the ideas rooted within internal UdB structures. This version of struggle must be portable, reproducible, and must expand the ranks of UdB, not in a way that is dependent on frentes or coalitions, but does not exclude working with other progressive forces, unions and organizations. Our strategies must be inaccessible to liberal forms of struggle that will opportunistically get out in front of the anti-trumpista struggle to claim ownership of it. The elaboration of agit-prop tools will be essential to this process – for internal UdB unity, to provide a unified and legible face to our communities, our allies, and even to trumpistas. This material should serve to unify and discipline our public profile and our political discourse to stay within the revolutionary self-defense framework of this position. We should resist the impulse of unsubstantiated/ adventurist radicalism in our rhetoric and in our practice. Our community work should be expanded across our 11 sectors of struggle, and within each sector of struggle, we need to elaborate a relevant and accessible analysis to contribute to this framework. Being a member of a movement organization. Organizing year-round; not just to prepare for marchas and protests. When we do organize marchas and protests, our most urgent goal should be to try to convince as many participants as possible to join a movement organization. Collectively discuss and develop political analysis, strategies, and tactics. Engage in actual community-based organizing with real people (not just on social media), and this engagement needs to be guided by a clear political line and clear political objectives. Unión del Barrio has now assumed a “self-defense” footing, and calls on our supporters and our communities in general to participate in the formation of “Bases de Auto-Defensa Comunitaria.” We will accelerate our work to build and consolidate Unión del Barrio as an organization capable of promoting and defending the interests of our people, wherever we find ourselves repressed and exploited within the current borders of the U.S. For nearly four decades Unión del Barrio has led struggles opposing migra and police violence; defended the rights of workers, prisoners, mujeres, and youth; and even launched numerous independent electoral campaigns, and we have accumulated the organizational experience that is necessary to put out this call. Now is the time Compañeras y Compañeros… We cannot allow fear and frustration to immobilize our communities! The only way to resist trumpista fascism is with disciplined, organized struggle. This entry was posted in 2017, Analysis, Analysis, Anti-War, History, History, Organizational Updates, Solidarity, Statement. Bookmark the permalink.